Are case manufactures already starting to crank out cases for the yet-to-be-released 5.5-inch version of the iPhone? 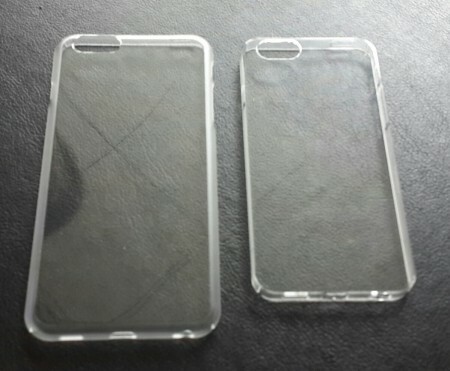 Nowhereelse.fr has spotted a leaked picture posted on MobileFun.co.uk earlier this week that purportedly shows two different cases for Apple’s two upcoming iPhone 6 models — one that would fit a phone with a display measuring 4.7 inches diagonally and another that measures 5.5 inches. Nowhereelse.fr cautions that MobileFun.co.uk hasn’t typically been a hotbed for accurate leaks in the past, while also pointing out some possible inconsistencies between the cases shown in the picture and reports we’ve read about the larger iPhone 6′s design. However, it does appear that the cases show a new hole on the side in the same place where Apple will reportedly move the power/sleep/wake button. There also appears to be a new opening on the top of the case across from where the old power button used to be though, so there is still plenty of mystery as to whether this is a legitimate iPhone 6 case or an early prototype that won’t bear much resemblance to the actual device. It also might just be too early for case manufacturers to be building cases for the new device, especially since the most recent reports we’ve read say that the bigger version of the new iPhone won’t launch until the fourth quarter this year. Other recent reports about the larger iPhone 6 indicate that it will be much slimmer than current iPhones and will have significantly smaller side bezels so that you’ll be able to have a big screen that you’ll also be able to comfortably in your hand. The new picture of the purported cases is worth checking out and can be found below.